With uncompromising performance that shrugs off weather, recoil—and is easy on batteries, the new P-TACTICAL SPUR might be the perfect optic for your carbine, pistol or shotgun. Its lightweight body is shockproof, waterproof (IPX7) and boasts 15,000 hours of continuous use on a single battery. 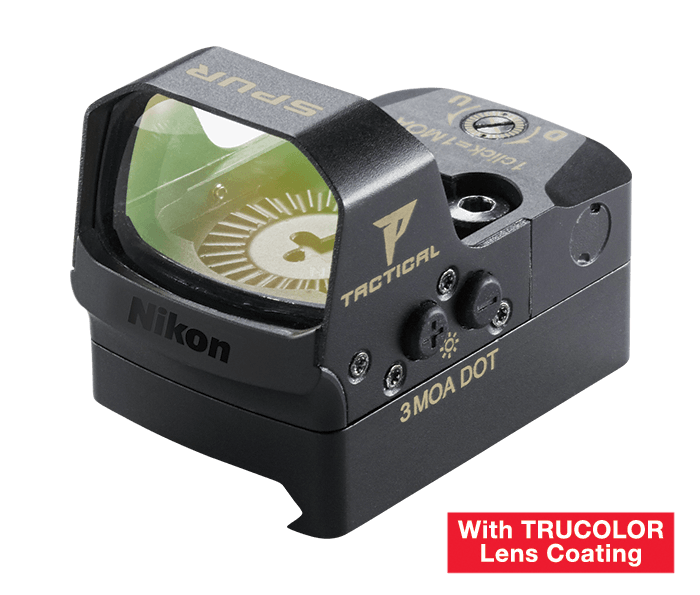 An extra-wide field of view, 1x optics and unlimited eye relief aid in quick target acquisition, while Nikon’s “TRUCOLOR” coating minimizes the bluish tint common to reflex sights. The P-TACTICAL SPUR’s 3 MOA dot is adjustable to 10 levels of brightness—the initial two of which are night vision compatible. On virtually any platform you mount it on, P-TACTICAL SPUR will be ready to serve you well. Fully multi-coated optics with “TRUCOLOR” coating to minimize bluish tint for clear natural view and increased dot brightness. Wide field of view, 1x magnification for enhanced target acquisition speed. Picatinny Rail Mount included. 3 MOA dot has 10 levels of brightness settings (the initial 2 are night vision compatible). Low Battery Indicator visually alerts user in display. Waterproof performance (IPX7). Shockproof construction withstands recoil and impacts. Lightweight, durable aluminum alloy construction.